This will grow each week, if not faster: Drawings are invited now. Class flying. Informal league founded on one class of hang gliders. Model flying. Informal league founded on just one model of hang glider. Biplane hang glider flying league. Perfecting biplane hang gliders for contemporary flying. Triplane hang glider flying league. Launch loving. Contrary to Otto seeing launching as a "difficulty" ... take launching in itself as a special time of joy to be repeated much more frequently. The hang glider has sails, upper and lower; the hang glider pilot has pod harness; the hang glider pilot has ground-placeable camping sheet and perhaps other things. Each sail, each piece of pod harness, the ground sheet, clothes, etc. are all with surfaces that can be spread to receive sunshine during a landed pause in a fliking flight trip over many days, weeks, months, years. During the pause, the hang glider pilot spreads the lower HG sail material, spreads the layers of surface of all the other parts ...to receive sunshine. The sunshine is ...by the design of the surfaces of all those parts...converted to electric charge at the highest efficiency possible to the state of the art of such conversion devices; the charge loads a lifetime true ultracapacitor set (which ultracapacitor set uses the frontline nanotech enhanced technology). Because of the broad surface, not just the upper sail of the HG, the ultracapacitor set is recharged quickly. The flight system then is packed to the second uses: clothes, pod, lower HG surface, ground sheet as padding in pod, etc. Ready to fly: the pilot runs fast on flatland or slope or inflates water-flotation launching-landing skis...and takes off under assistive power, if needed, with an efficient electric motor and foldable large propeller of perhaps counterbalanced single-blade propeller. 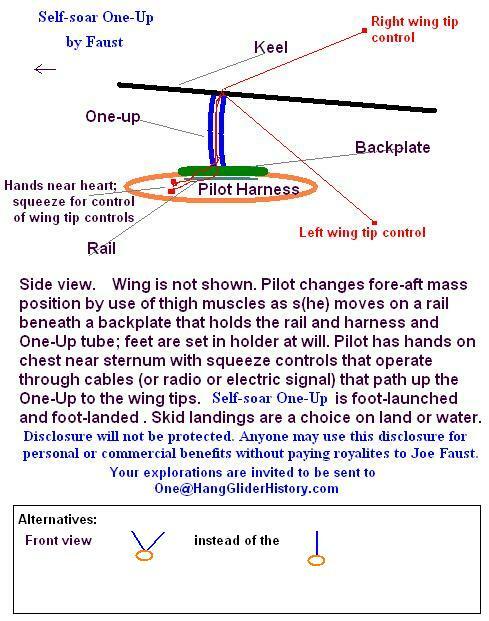 This flight system will permit use of many kinds of lift in the atmosphere for hang gliding and hang soaring. Not limited to any particular wing design (inflatable airbeam based, flexible-wing based, rigid flying wing based, multi-plane types, etc. ), the fliight system will permit lifetime flying over land and sea with pauses on land or water; the recharge method of extended surfaces is a key part of the system. The advanced ultracapacitor set is key. Control systems may vary, of course; the cable-stayed triangle control frame evident in hang gliding in Breslau territory in 1908 and further instructed in 1921 with Espenlaub and 1929 by Spratt and many others in fixed and rotary wing aircraft is just one control airframe arrangement; U and wide-U and strutted stays, etc. are included in this integrated flight system. Fine-tuned part design will sharpen this flight system. That the integrity of the flight system is herein described, it is also given at the same time to public domain. November 3, 2008, Joe Faust. Port-a-slope solutions are varied and extensive. See: OZ on Casellas-Jalbert Portable Dune for starters. Adults less than one-meter tall will increasingly fly hang gliders. Rise of plans and homebuilding era made safe via online remote diagnostics and one-by-one certification ... Kits shipped by the millions around the world. Ford Motor Co. finds its place in mass producing quiet trikes. Fixed upper tip winglets with below-wing tip wing rudders and wing-tip guards...what is the full story here. Magnus-effect wing hang glider. Soarability? HG vs PG on this? Rotating ribbon PG; single or multiple. Wind multiplier. Towing launch via WM. Windmill multipliers. High kite wind multipliers. http://web.archive.org/web/20030604035820/http://www.wizard.net/~jmallos/skybow/ PG? Magnus Effect PG? How wide can a skybow be? ""Tony Frame and I have flown skybows in widths ranging from 10mm to 25mm. (Tell me about your experiments.) ""
Nearly all surfaces generate electricity and used for various actions during fliking of the hang glider system. Thermal-seeing ends up not destroying the sport of hang gliding, because new kinds of tasks are designed. What about powering a self-launch by beam from ground to a receiver; leave the batteries or power-source on the ground; beam me up; see Space Elevator for such! Be able to in-flight communicate the aim of the feeding ray to your hang glider wing; have the wing be the receiver. Graeme withdraws a first priorly-published interpretive meta-claim about the Dickenson kite-glider. Estimate year: 2029. Cost: $97,000 in a back-room deal by HGMA. 2050: Even though the cable-stayed triangle control bar for hang gliding was present at least in the gliding club in Breslau in 1908 on a battened foot-launched hang glider: Every manufacturer of hang gliders sends $39,000 to Australia for royalties on the Maxim-Pilcher-Montgomery-Hargrave-Breslau-Espenlaub-Spratt-Bensen-SkiKite-Palmer-NASA (reduced)-Trapeze thingy because of a court decision in Grafton by GH; and a pardon is granted to Faust and he gets out of the Sydney prison at age 108. British authorities want a cut, since they kept an interest in Hargrave. Proof: 38 certificates and plaques commemorating local adrenaline---look, that is not a flat kite, it is Superman! A year later, refunds are given, as a closer look at Leonardo's fuselage reveals suspended pilot and a control bar....again. Everyone kisses and goes out to fly. A fliking hang soarer lives a month on the bugs collected during flights and on the water collected during flights in a smart-winged hang glider. Perma-kytoons provide flight-park launch for hang gliders. Dave Culp manages part of the growth of the new business. Kite Tugs have a side business in giving launch to hang gliders. When will rigid wing hang gliders be more popular than flexible-wing hang gliders? Nanotech parts, nanotech foams, nano-tensegrity, smart parts, etc. may bring such utility, performance, safety, etc. that foot-launching from flatland with a non-flexible-winged hang glider might become more popular than flexible-winged hang gliders. Flatland foot launching to soaring flight by running, followed by muscle-powering thrust propeller, followed by real-time solar powered assist advances greatly. Nanotechnology takes over the hang glider scene. Inflated tube Port-A-Slope for hang glider slope soaring and long-distance flatland travel. Increase of base launching for hang gliders. Elevator up. Off you go. Skyscraper living. A Dickenson kite is found and examined and weighed. A Dickenson glider is replicated and compared with a Kilbo Kite. Kilbourne speaks out. Mike Riggs tells all about the origins of his designing of his triangle control bars. Static-line and static-anchor self-launching to soarable altitudes with full retraction of all pieces of launch parts to flight system is achieved for 12 mph flatland winds at a safe level of operation. Fliking blossoms in a big way. Biplane hang gliding movement blossoms for various reasons. Flatland self-launch to self-soar fliking advances superbly. Moon City features hang gliders. Someone flikes around the world with their hang glider. Indoor wing-assisted high jumping formalizes to a minor sporting event, as does wing-assisted long jumping. Remote controlled cameras follows one's hang glider flight; the flying camera automatically keeps a safe distance from your hang glider. Torus Space Colony hang gliding is introduced. Three-piloted hang gliders (left-tip hung, center hung, right-tip hung) popularized. Drawings are invited now. The two-pilot hang glider with one pilot at each wing-tip has already a beginning; advanced designs are coming. Strong blurring occurs between virtual hang gliding experiences and natural hang gliding; real hardware sales drop because of this blurring. Nanotech-based inflated structures deeply affect hang glider design and safety and recovery systems. I am looking forward to when the entire surfaces of every exposed surface (top, bottom, side) of wing, pilot's clothing and wraps, cables, etc. are converting direct sunlight and all indirect light into electricity for driving and storing. And what about converting turbulence, vibrations, excessive lift into stored energy. Reefable spars are perfected using nanotech-based materials. Comprehensively "smart" hang gliders are commonplace. These hang gliders morph to the flight needs, run extensive safety checks in real-time, records full flight in 360-degree view and posts all such matter in grounded archives. Someone eats a hang glider that was flown successfully. AtoMESWT finally gets full attention by hang glider pilots as they care to fly more easily. Real-time video 360 degree view of hang glider flights published on Internet are commonplace. Hang Glider History Timeline will be very robust. A very robust timeline may help a little bit in historians writing their perspectives of hang glider history. Just one of many places to meditate on aviation's rich contextual history. A practical hang glider is designed, manufactured, and flown by robots. streamlined pilot presented two days ago and presto...travel the world. off water surfaces and have the go-anywhere hang glider. Ulti-Up (tm) of Nov. 1, 2007 :: The Ulti-Up One-Up has airframe which is with airbeams that are super-pressurizable yet of thin-flexible wall for low tote volume when not in use. One leaves enough pressure to keep the integrity of the airframe; excess pressure is used for special launching of flight-saving flight sectors. For reliability and stability of sizing, advanced nano-engineered film will be used. Ulti-Up floats on water. Inside double-surface is shelter from elements while at sea on water at night. Sun will be used to obtain potable water. Sun will be used for some hydrogen generation for some sub-system uses. Food: Nano-smartly made from molecules in ambient and recycled environment. Some inventions are yet needed to complete the full self-soar system. The sun's rays will not appreciably damage the integrity of the flight system. Distance records while staying under 500' AGL utilizing advanced gust utilization? Rapid canard and wing-tip sensors for automatic yaw, roll, and pitch commands relative to gust events.